I recently got a Jenday Parrot (my first) and she has a strong preference to females. The pet shop carer told me about this prior to purchase. I spend hours with her on a daily basis but when she's out of the cage and my girlfriend is there, she will barely let me touch her but my girlfriend can cup her, kiss her, etc. The parrot is a bit more fearful of me and it's really frustrating because one of my life's dream is to have a companion parrot but it seems like my girlfriend (who hardly cares about birds) is already living that. I'm reading and applying a lot of the things in Michael's book and it's been a great help but this is something that I haven't been able to adjust. It takes a good bit of time. The stronger the preference, the longer it will take. The main thing is not to try to force the relationship. Let it come with time and training. Be happy the bird tolerates anyone at all cause most start out nasty to everyone. Treat it like a vicious rescue case, do the training, be patient and everything is possible. Welcome to the forum and congrats on your new baby although I am sorry it did not choose you. That aspect of parrots is very frustrating and, I am sorry to say, there is very little that can be done about it so I doubt that Michael's book can help you with that as it is mostly about training -which you should not do with what I assume is a baby bird. If I am right and this bird is, indeed, very young, I suggest you don't train it at all as it will backfire on you, especially since the bird is not bonded to you. Training is a tricky thing with parrots because they did not evolve to be subservient or even obedient [they don't live in hierarchical societies so, as there are no leaders or alphas, there is no need for an obedience or subservience trait] so they don't have the genetic make up for it. It's not that obedience cannot be achieved, it's that the process is long and it has a very definite pre-requisite: the bird has to trust and love you first. But don't worry too much about its preference for a woman, it's most likely because the breeder and the caregiver in the petstore were women and that's all it knows. But this doesn't mean that it will not learn to love you, too! Now, hand-fed parrots are imprinted to humans so the taming part is already taken care of but you need to build the trust first and then the love bond. Once the bird trusts you implicitly and loves you, it will want to please you. I don't do any training whatsoever and don't give rewards for obedience but my birds are all pretty well behaved and very obedient [sometimes, even more than my dogs and cats!]. The way to earn their trust is to not force it to do anything. You can ask it to step up but, if it doesn't do it, turn away and do something else for a few minutes. Then ask again and, again, go by whatever the bird decides. But don't ask more than three times and don't do it in a row either - you will only create resentment. Parrots are highly intelligent and empathetic animals and actually reach conclusions on their own so treating them with the same respect one would another human being goes a VERY long way with them. Keep your daily routines to the second, always doing the same thing every day at the same time. Mind you, parrots go by the sun so this doesn't mean the same time by the clock but by the sun like always uncover and open the door to the cage when there is the merest amount of light in the sky and before the sun actually rises, always give it its breakfast 1/2 to one hour after this. Allow it rest time at noon, turn off the overhead lights once the sun is halfway down to the horizon and give it its dinner 1/2 hour after this, covering the cage once night falls and the bird is asleep. Parrots are photoperiodic and need to follow a solar schedule or their endocrine system goes out of whack. The best times to interact with the bird [things like shoulder time, playing games, etc] is after breakfast and before their dinner. Talk, sing, whistle, dance for the bird and, every now and then, offer it a treat (something like a sliver of an almond, that kind of thing] but not as a reward for 'good behavior' but as a token of friendship. And limit its interactions with your girlfriend to the merest necessary so it doesn't keep on bonding with her instead of you. Is this bird just a few months old? Because, if it is, you need to offer it soft food served fresh and warm twice a day. I am sure that you were told that the bird is completely weaned but the reality is that breeders and pet stores wean way too early so as to move the 'merchandise' fast. In the wild, parents continue supplementing their food intake for months and months after the baby starts eating on its own. And, if it's very young, I suggest you handfeed it with a syringe because there is absolutely no better way to make a bird bond with a human than handfeeding it! Pajarita wrote: Welcome to the forum and congrats on your new baby although I am sorry it did not choose you. That aspect of parrots is very frustrating and, I am sorry to say, there is very little that can be done about it so I doubt that Michael's book can help you with that as it is mostly about training -which you should not do with what I assume is a baby bird. This is absolutely untrue and I have proven it multiple times myself and through countless clients that I have helped as well. When I adopted Santina, she came with a "like women/hates men" clause. However, through training I got that turned around and she bonded with me. Later I adopted her to a woman that she was uncomfortable with at first but through training came around to as well. In my most recent video you can see that she is good with both. Kili, my Senegal, has always been bonded to me and disliked everyone else but now through training she is great with my wife. 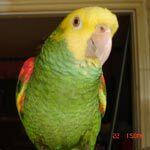 Rachel, my wife's Blue and Gold Macaw, disliked men before but through training developed a great relationship with me. Certainly it's more work to overcome these kind of initial setbacks, but there is definitely plenty that can me done to make it work. The only thing that won't make it work is just giving up or accepting it. Also my book is not mostly about training. It's a manual for living with pet parrots. Training probably only makes up about 1/5 of the book. Most of it as about keeping parrots safe, developing a good lifestyle/routine, and having fun in the process. Training is a key ingredient but it is only one part of the picture. Thank you both for the advice. My bird is not a baby. She is a year and a half to two years. After talking to my girlfriend and a friend who owns a Macaw, I realized that I only let my parrot out when I want to train her. And it's obvious that any parrot does not like to be ordered around every day, twice a day near breakfast and dinner. I'm learning from my mistakes and I will let her out for a while without doing formal training and just talk to her, interact and do the things you suggested @Pajarita. I will let my girlfriend know that she should not interact with the bird much. I'm sure she will respect the call. @Michael, I'm glad that you've dealt with this before and know that it's something that can be worked with. It's only a matter of time and patience, I suppose. Michael, I think that you give too much credit to training and not enough to feelings, and I think that part of that is that you don't believe that parrots love. I am SURE that your birds did end up bonding with you after a while, same as Santina with her new owner, but I don't think that it was training that did it. If training was an essential part of bonding most parrots out there would not be bonded to their owners -including ALL of mine- and they are. I think that good care, respect, patience and showing affection for them is what makes them bond with us. If you love them, they will love you - same as any other animal. There are tons and tons of cases where the owner loves the bird and the bird wants nothing with them. Love alone isn't enough. I never said that I don't believe parrots love. I just said there isn't any definitive evidence that this is the case. It's usually based on peoples' feelings and anthropomorphism and not on anything solid from the parrot. It seems to me that my parrots love me but it does not prove that they do. Love is a very complex thing even with people. We grow to love often, and often relationships are based on how well we mutually cooperate, or support one another. A parrot will go for what they need in a partner and it may not be the one who loves them emotionally the most. I am sure my parrots love me, but parrot love is different that human love. I dont even completely understand human love. But I understand a good relationship between people and between a parrot and people because I can observe it. Training a parrot is a form of interaction and communication so training is much more than just "training" It establishes a good bond. I have watched a lot of Michael's training videos and read his tips, and that is a good training that establishes a good relationship with your parrot. Michael has a good point. Even if you show love to a bird, it's not enough to make them bond with you. One of my budgies was hardly trained. I talked to her, read books to her and showed her respect. But that wasn't enough to get her comfortable with my presence nor my hands. After offering her spray mallet consistently, she would step up on my hand and wouldn't mind. It's been seven months, and the only reason she can stay calm with the presence of a human is that of pure step-up training. With a combination of training, respect, care, and love.. you end up with a companion. I've had no problem training my two budgies through simple training. The parrot situation is slowly getting better. Again, thank you three for your input. Parrots, like people, change their BFFs. Rainbow and I knew of each other before he came to me. When I brought her home she fell in love with me for bringing her out of a quiet house and into my kaos. She did the opposite of what you would expect a parrot to do in a new setting. I was #1 until she met my mother, her "Grandma" who took the place or #1 and I was moved to #2. When my daughter moved in to help me care for the elders she moved me to 3rd place. Aunt Betty was #4 and a good person to pick on and make her scream. When her "Grandma" died my moved to daughter #1, I was #2 and Aunt B was given a better place since she was as close as Rainbow could find as a Grandma. She stopped picking on Aunt Betty and would climb her chair to sit with her. When I went after Myrtle who was just a year old she was scared of everything. She was even afraid to come out of her cage. She was only a 4 hour drive from home but I got a motel room so she could meet me before going into Kaos. When I got her home she was so afraid of everything that she depended on me. The only time she came to me was when she jumped off her cage trying to fly but hit the floor. She would climb me to get on my shoulder for me to walk her back. Way before I could touch her she went wild for my son when he came to visit. She would step off the top of her cage to get on his shoulder. I was still #1 but she loved him. Momma was next. Aunt Betty was good to pick on just like Rainbow did. Rachel was the last and after 6 years she is still last. The only time Myrtle would interact with Rachel was when I was not home. Sorry for the long response but I am truly fascinated by these girls.